This latest post shows some of the progress being made at an Expat project in Bangkok. The team just recently completed the driveway – a nice concrete sett pattern of eight and four sided blocks to give a very smoothe and balanced symettry. At a later stage, the driveway will also be sealed with epoxy paint, so that water and dirt marks take longer to penetrate, keeping the driveway looking better for longer. The whole driveway area had to be raised with earth and sand and then a type 2 aggregate mix layer was spread and compacted. A poured, reinforced concrete border surrounds the drive to keep the sett blocks even and firmly in place. The new driveway has made this project accessible and given real definition to the entire landscape. 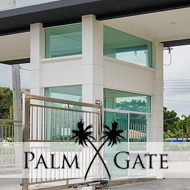 If you’re building your housing project or development in Thailand and could use a hand with the design and install of the landscaping, contact Thai Garden Design.